Simon & Schuster, 9781501172120, 256pp. Lindsey Mead has written for Brain, Child Magazine, QuietRev.com (Quiet Revolution), LiteraryMama.com, and Huffington Post. She received a BA in English from Princeton University and an MBA from Harvard School of Business. She lives with her husband and two children in Cambridge, Massachusetts. On Being 40(ish) is her first book. “If you are, ever have been, or ever plan to be 40(ish), you’ll find this collection irresistible. 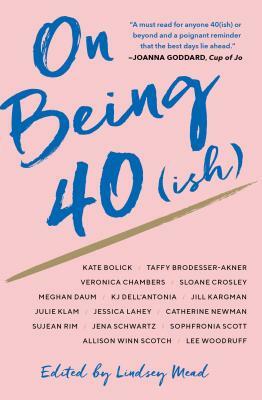 Drawn from the experiences of some of the best essayists of our time, ON BEING 40(ISH) reveals that our forties can be the best of times, the worst, the saddest, funniest and often the bravest and most revelatory. This will be the book I give every 40(ish) friend this year.